Seven Stories Press, 9781609806941, 352pp. Pioneering black-and-gray tattoo artist Freddy Negrete was twelve years old and confined in the holding cell of a Los Angeles juvenile facility when an older teenager entered—covered in tattoos. Freddy was in awe, not just of the art, but of what it symbolized, and he wanted what this kid had: the potent sense of empowerment and belonging that came from joining a gang. The encounter drove Freddy to join the notorious gang La Sangra, and it didn't take long before he was a regular guest at LA County's juvenile detention facilities. By the age of twenty-one, Freddy had spent almost his whole life as a ward of the state in one form or the other. Enthralled by the black-and-gray tattoo style that in the 1970s was confined to the rebel culture of Chicano gangsters and criminals, Freddy started inking himself with hand-poked tattoos. Everyone wanted a piece of Freddy's black-and-gray style--gangbangers but also Hollywood starlets and film producers. 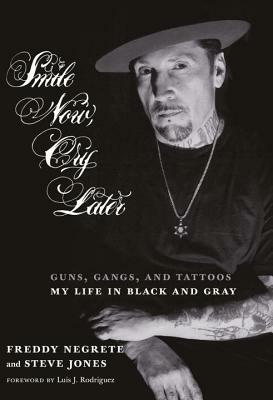 In a riveting narrative that takes the reader from Freddy's days as a cholo gang member to evangelical preacher to Hollywood body art guru to addiction counselor, Smile Now, Cry Later is, ultimately, a testament to that spark within us all, that catalyst which gives us the strength to survive, transform, and transcend all that can destroy us. Legendary tattoo artist FREDDY NEGRETE is best known for his pioneering black-and-gray tattoo style, honed while serving time in a series of correctional facilities during a youth mired in abuse, gang life, and drug addiction. His "joint-style" designs eventually found their way out onto the streets of East LA and, in 1980, he created a piece that earned him a Tattoo Artist of the Year Award. After a ten-year period of renouncing his tattooing success in favor of bible study and becoming the pastor of his own church, Freddy eventually returned to tattooing in 1990 to find that he had become a tattoo superstar during the decade he had been away from the life. Freddy has been featured in the History Channel's Marked series, in the documentary Tattoo Nation, on Spike TV's Inkmaster as a guest judge, and in numerous print, online, and video publications. In 2007, he was awarded a Lifetime Achievement Award by the Body Art Expo, one of the biggest and most established tattoo conventions in the world. Having suffered the ravages of drug addiction for many years, Freddy is now also certified to work closely with young addicts at Beit T'Shuvah in Los Angeles, a treatment center based on Jewish spirituality and Twelve Step principles. Freddy lives in Hollywood with his son Isaiah, who is also a successful tattoo artist. They both work at the Shamrock Social Club on the Sunset Strip and have tattooed numerous celebrities, musicians, and sport personalities. "[Freddy Negrete] was the man who took the Chicano, black-and-gray, joint-style straight out of the prisons and to the top of the tattoo world. To this day, Freddy's work never ceases to amaze me."